Dumpster diving is not on my bucket list. Yet. But I must confess, I am now an official trash pile picker. On one of our daily weekly sporadic walks, Saint pointed out the large pile of junk materials that one of our neighbors had accumulated. This was not news to me. I had been coveting eying that pile every time I drove by it. “Wonder what he’s planning to do with that?” I asked. Our walk continued uneventfully until we were returning. Rain was in the forecast. That burn ban might be off in a couple of days. My feet guided me right up the back way and straight to that neighbor’s door. Saint stood way back at the end of the driveway, like he was embarrassed or something, as I asked the neighbor if they were throwing away the dresser frame in the back. She smiled. “Help yourself,” she told me. After a minute few minutes while, Saint decided he should go get the truck. Here are a few things I dug out of the pile. 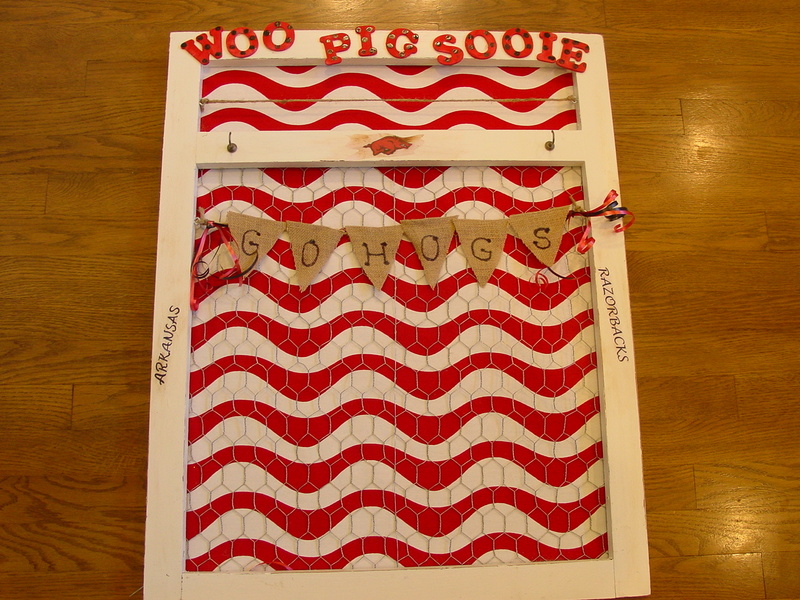 And, since SEC football is starting, I had this idea for one of the old windows. 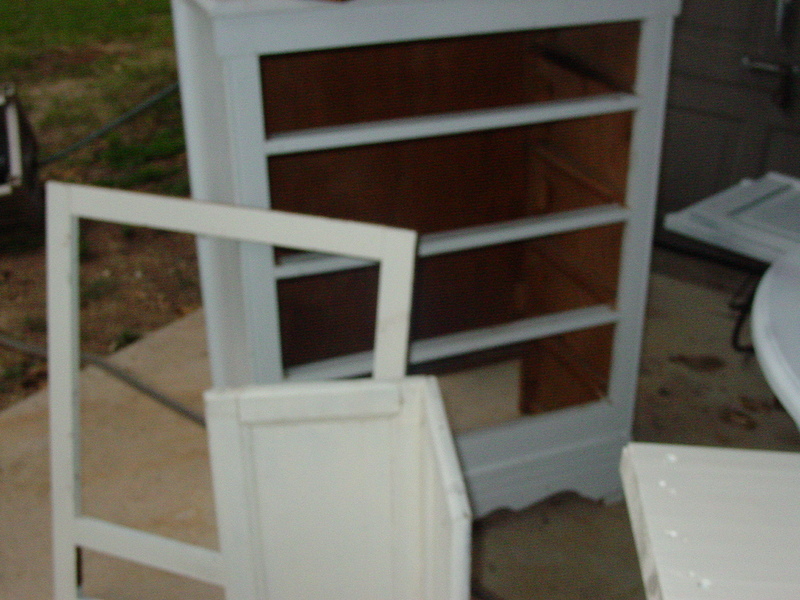 First I cleaned, painted, and distressed (that didn’t take long…I got it out of a trash pile, after all) it. Then I used some of that hazardous wicked chicken wire (I had lots left on that huge roll, remember?) 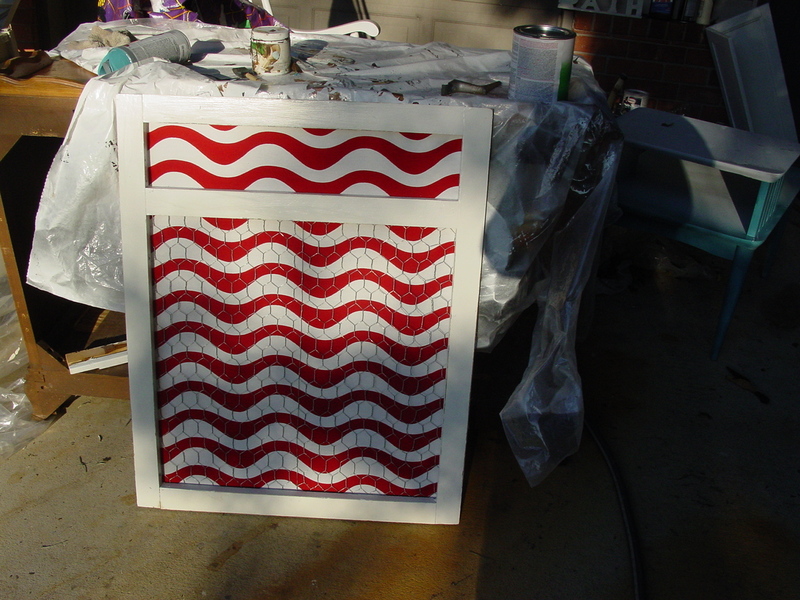 and some red and white wavy fabric. Saint helped me staple everything to the back. I painted and dotted some wooden letters to attach to the top and screwed in a few eye hooks to attach some heavy twine roping. 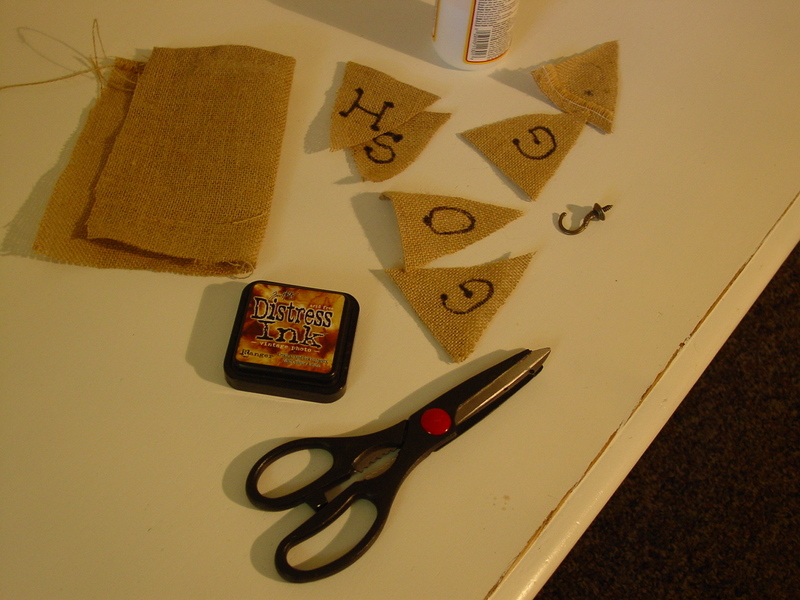 Then I added a few symbols and letters with decoupage, and no project of mine would be complete without some burlap, so I cut out this banner. Go ahead! 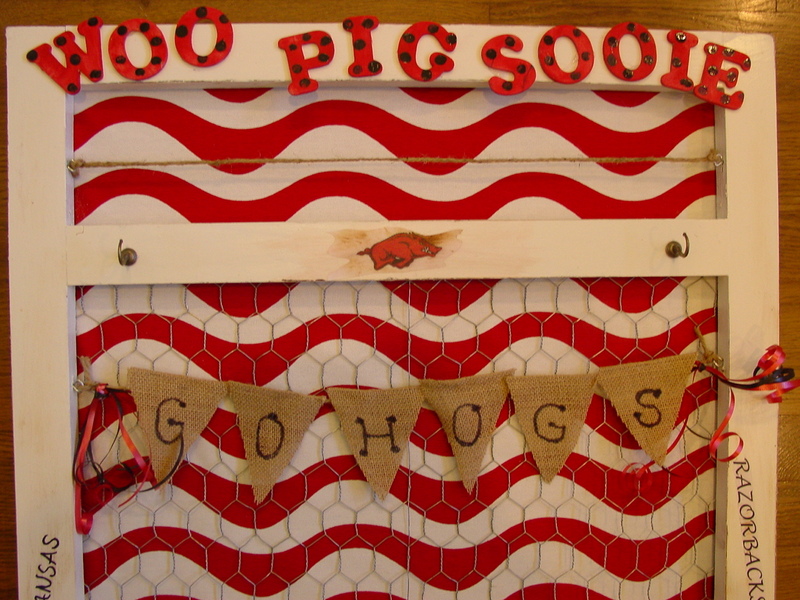 Call those Hogs! I can think of all kinds of ways to use this. 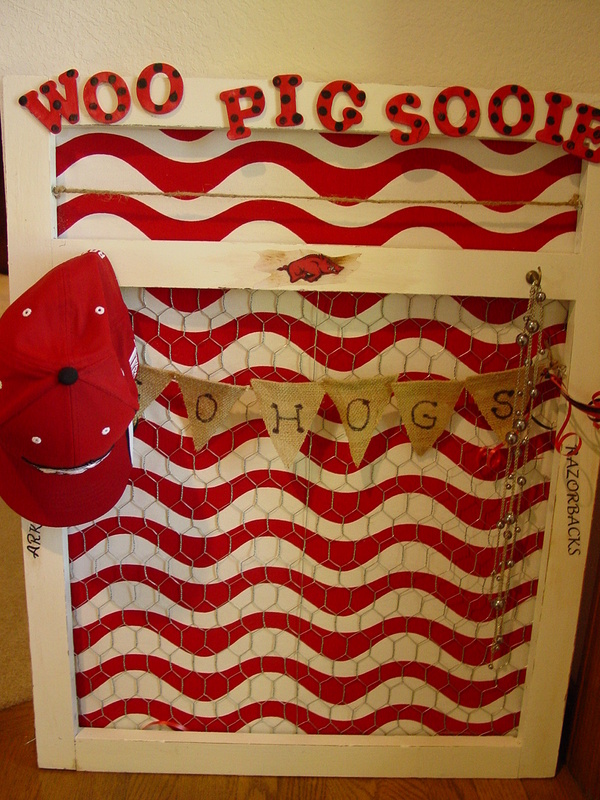 For a message board, just add a Razorback schedule, some cute paper clips, note pads,etc. Or use it as a welcome sign for your tailgating party. I really intended it to go in a dorm room. Hats, visors, jewelry, messages, assignments.